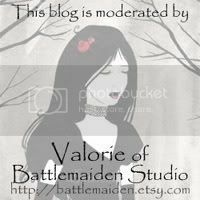 Battlemaiden Studio: Vinyl Decal giveaway! I will be adding the last of my new vinyl decal designs to Stickerella today and tomorrow. I'm really excited about how well received this whole venture has been, and it's got my head buzzing with new ideas! Comment here telling me your favorite item in my vinyl decal store. This will get you 1 entry! Comment here with a suggestion for decals you'd like to see in my store in the future. I love to hear your suggestions! This will get you 1 entry! Purchase from my vinyl decal store. This will get you 4 entries for every item you purchase! Individual lines in custom orders each count as a single item. Blog about me! Mentioning (link please) my blog or Stickerella in your blog gets you 2 entries. Be sure to comment here with a link to your blog so I know to count them. So, that's a total of 2 possible entries per person for comments to this blog, 2 possible points for blogging, and an unlimited number for purchases. Be sure I can contact you if you're the winner, or check back here to see. What's the prize? Well, that's up to you! You can choose any item in my vinyl decal store that you'd like. If you're the winner, and would like for me to make the decal you suggested for my store, I'll happily do that as well. I love the custom sticker for your car window. Took a peak into your sold items and found a lovely butterfly, too! Gosh I was so enamored by the shop when I went to visit it a few days ago that I forgot to come back and comment! As a member of the SCA, I have to say your Heraldic ones, especially the Heraldry Gryphon, are stunning. Even if I don't win I will be in touch about a couple of them. Now for a custom, I would like to see a heraldic boar. I like the lion one best! And my suggestion would be to have a few more decals with color! i like teh star wars decal. i'd love to see some personified stuff like baseball or soccer or something like that. I love the custom car decals. LOVE the black cat! Very cute. Love love love the black cat (seeing as I have two!) and the pentacle. My only suggestion would be a lone triquetta or a simple pentagram. Cool store, you're bookmarked, will return. I love the butterfly in the sold section and the Heraldry Unicorn. Thanks for entering me. I think some sort of heart, or a fairy would be cool. My husband would love the Jolly Rodger decal. I like the black cat. Thanks for the giveaway! I love the black cat. I would suggest dogs or horses. I love the "Alliance Lion World of Warcraft vinyl decal"...very kewl!! Id love to see you do a dragon decal, along the lines of a Celtic dragon. I would love a custom one that said, "nurses are angels with wings"
The Cthulhu Nom decal is all kinds of cool. I'm a huge Lovecraft fan. Thanks. I love the Black Cat. It would look so cool at the top of my stairs. Things like fairies and gnomes would be cool. I don't think I've seen anyone else making them. The raven is my favorite one! I would love to see more Star Wars stuff. Maybe a Death Star or even the ships would be cool!!! Could you do a Vampire Bat? My favorites are the black cat and raven! the jolly roger is cool. Love these decals! It's really hard to find cool stickers for car windows that won't fade or peel - believe me i've tried! Of your current pieces, I think the mjolnir & the griffin are both very cool. But, I think you should look at adding a dragon or two, and some celtic knot work. One other thing, the windows of my car are dark, so I can't use black vinyl decals - they don't show up. You might consider having other options available. Okay, For the Horde got me! I miss playing WoW but just no time these days. I did like the butterfly in the sold area and I'd love a ladybug! I like the Pentacle Knot Vinyl Window Decal Celtic Knot. I love your stickers, but if I win, I think I'd get a custom one. I really like the black cat! I like the raven and the pentacle vine symbol. Thanks! I'd like to see more nature inspired, trees or more viney things. Thanks again! My favorite is the black cat. Great decals. My fave is the Raven, but i also really love the celtic one. I like the raven but I'd love to see something "beachy'! A seahorse, an Adirondack chair..a cabana, sea urchins....I'd love some at my beach house. Oh...and for my "girlie" room... a silhouette of maybe a Victorian lady with a hat or a Southern belle. i like the black cat decal. i would like to see some floral patterns...like flowers, leaves, things from nature...perhaps even polka dots designs. I'd love the Custom Vinyl Decal! Thanks and love the site. My kids would love it if I put a Jolly Roger decal on my car window! I love the mysterious-looking black cat decal. And I would like to see more animal poses in creative angles.